Click here for audio of Episode 1525. Today, an amateur builds ships. The University of Houston's College of Engineering presents this series about the machines that make our civilization run, and the people whose ingenuity created them. The United States built only two ocean-going, dry-cargo freighters between 1922 and 1937. Historian James Chiles tells how our merchant shipbuilding was nearly dead in the water on the eve of WW-II. All the Allied shipbuilders were hopelessly committed to warships, and Axis nations were torpedoing merchant vessels off the surface of the sea. Great Britain in particular was in desperate straits. Without cargo ships, she couldn't hold out. Someone clearly had to start making freighters from scratch. In 1940 the British turned to a group of American construction companies out of whom Henry Kaiser emerged as a leader. He'd worked on Hoover and Grand Coulee Dams, but never any sort of ship. The British carried plans for a lowest-common-denominator freighter -- the sort of simple steam-powered merchant ship you'd expect to see in a 1930s movie, set on a foggy waterfront. Kaiser had neither workers nor shipyards. But more than any of the builders, he turned his lack of preparation to remarkable advantage. Did it take years to train a well-rounded shipbuilder? Fine. He rearranged work so he didn't need well-rounded people. He broke shipbuilding into prefabricated components so each worker had to learn only a piece of the job. Did he need heavy equipment to cut metal plate? No matter. He used oxyacetylene torches. He replaced rivets with welding. He even cut the time it took to train novices to tightrope across steel structures by hiring ballet dancers as fitters. Kaiser redefined shipbuilding to match his resources. He introduced assembly-line techniques -- interchangeable parts on a gigantic scale. Ford had tried that in WW-I and failed. But Ford had tried to build an avant-garde torpedo boat. 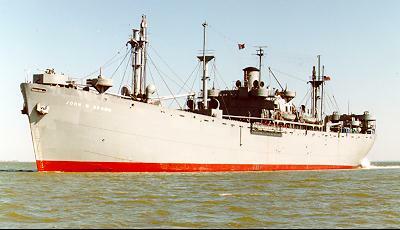 There was nothing remotely new about Kaiser's product, the famed Liberty Ship. It was only 440 feet long, and it carried 8,500 tons of cargo. The first one was launched just after Pearl Harbor. Soon the Kaiser yards were building Liberty Ships in a month -- then in ten days. Finally they finished one in just four-and-a-half days. Kaiser ate steel so fast he had to set up his own mill. Behind the schoolboy excitement lay a dark side. We produced eleven million tons of shipping in 1942, but submarines sank twelve million tons. The next year we raised that to twenty million tons of shipping, and we prevailed. The Liberty Ship saved us. The Liberty Ship shows what happens when war drives technology. When Kaiser held shipbuilding up to the clear light of his amateur scrutiny, it wasn't ship design that profited. His work, rooted in a powerful common purpose, redefined shipbuilding. But, toward the end of the twentieth century, it was Asia that went on to claim Kaiser's shipbuilding legacy. America's shipyards no longer dominate the world. And, today, only two Liberty Ships survive. They've become floating memorials to that time when first-rate people built and sailed in second-rate ships -- and saved the world. Chiles, J. R., The Ships That Broke Hitler's Blockade. American Heritage of Invention & Technology, Vol. 3, No. 3, Winter 1988 pp. 26-32, 41. Empires of Industry: Victory at Sea, Mass Producing Liberty, (The History Channel, Video) New York: A&E Television Networks, 1996. This is a greatly revised version of Episode 91.